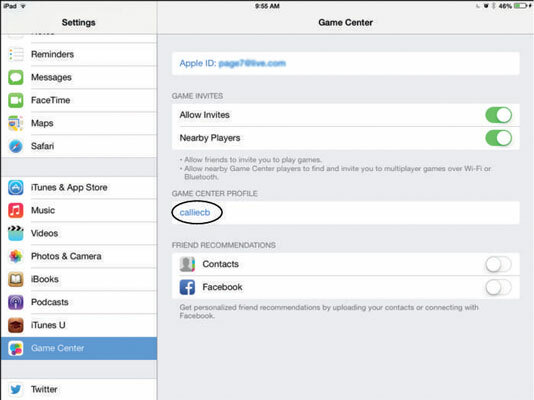 Tap Game Center, and in the dialog that appears, if you don’t want other players to be able to invite you to play games when Game Center is open, tap the Allow Invites Off/On button to turn off this feature. If you want your friends to be able to send you requests for playing games via e-mail, check to see whether the primary e-mail address listed in this dialog is the one you want them to use. If the primary e-mail address is the one you want to use, skip to Step 5. If you want to change the e-mail address listed, tap the current Apple ID and, in the dialog that appears, tap Sign Out. On the screen that appears, tap in the Apple ID field and enter another account. Or tap Create A New Apple ID. Tap to Allow Invites or to allow Nearby Players to find you and invite you to games. If you want others to see your profile, including your real name, scroll down and tap the current profile and then tap Public Profile On/Off button to turn on the public profile. Tap the Home button when you’re finished with settings and then tap Game Center. You return to the Game Center home screen, already signed in to your account with information displayed about friends, games, and gaming achievements (all at zero initially). When you’re playing games with others, your handle identifies you.